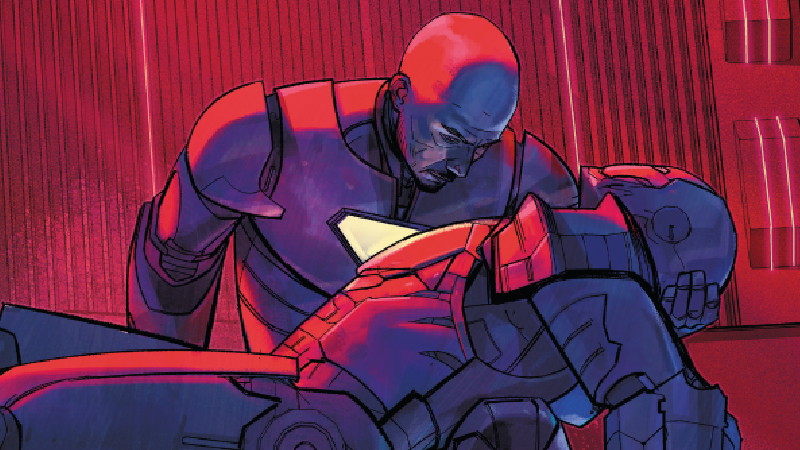 A very bald Tony Stark cradles the body of James Rhodes in Invincible Iron Man #600. We’ll get to the baldness, I promise. This week’s Invincible Iron Man #600 is not the first comic in which Brian Michael Bendis has bid adieu to Marvel, the long culmination of a journey that started late last year with the shocking news that the writer was jumping ship to DC Comics. But it is the very last, very wordy end to Bendis’ time at Marvel. Bendis’ goodbyes in the likes of Jessica Jones and Spider-Man were personal affairs—they were, after all, characters he’d helped create. Invincible Iron Man #600 is instead more like an endurance run through a checklist of plot lines built up over the last few years of Iron Man storytelling, not just in the pages of Invincible but in Civil War II, Infamous Iron Man, and more. No less than 17 artists and colorists join Bendis and letterer Clayton Cowles in the credits, many contributing just handfuls of pages throughout the issue, and Bendis manages to barrel through as many potential loose ends as he can, clearing the path for incoming writer Dan Slott to take the wheel where he can and closing off arcs where he can’t. The sheer scope of the issue means that, at times, Invincible Iron Man #600 is an almost confusing slog of closure, tripping up over itself as it jumps from one beat to the next—and depending on your taste for Bendis’ trademark reams of dialogue (largely delivered through the framing device of narration from the AI clone of himself Tony built to guide Riri Williams during her journey as Ironheart), the sheer density of it may make a cumbersome read even more perilous. But given just how deeply intertwined in recent storytelling Bendis has been, for not just the world of Iron Man but Marvel at large, it feels appropriate that his truly final issue for the foreseeable future is a madcap dash of dotting the “i”s and crossing the “t”s. So much actually happens in Invincible Iron Man #600 that it feels like a staggeringly difficult prospect to process it all. The recently restored Tony, who was in a coma in the wake of Civil War II and then mysteriously missing thereafter, is awake again, and also bald. Apparently the ever-tinkering Mister Stark has spent years tweaking his own DNA like he has his armors, which means instead of perishing during the finale of Civil War II, he merely went into a full body hard-reboot, which includes hair loss! Rhodey, a.k.a. the fallen hero War Machine, who died back at the start of Civil War II, is brought back to life after Tony does a similar “reboot” process for him (he also loses his hair, because, reasons). Meanwhile, Leonardo Da Vinci—the actual one, and, because this is Marvel, one of the original founders of SHIELD centuries ago—recruits Miles Morales and Riri Williams into his secret new organization designed to act in SHIELD’s place. And the Red Hood, possessed by Dormammu, prepares to begin a hostile takeover of Stark Industries, only to be interrupted by Doctor Doom—who I should also mention, if you’re not keeping up, has been acting as Tony’s replacement in the wake of Civil War II, complete with his own doomified Iron Man suit—and the newly returned Tony and Rhodey. And then, picking up on a prior storyline in Invincible, Tony’s father—his real father, not Howard Stark, a secret Hydra double agent who was believed killed by Tony’s secret SHIELD agent mother—also shows up; he’s promptly detained by Tony and his ever-growing-gang of armored friends in what is perhaps the shortest and clumsiest of attempts at resolutions in the issue. Rhodey and Tony bring in the cavalry to stop the Hood’s plans. That’s barely scratching what goes on in this book, and it’s enough for five or 10 volumes, let alone a single, bumper-sized, 42-page one. Given that there has been plenty of time to prepare for Bendis’ exit—even aside from the unfortunate extraneous circumstances of his hospitalization late last year, dramatized in his final issue of Spider-Man recently—that all this was saved for his final issue is almost baffling to comprehend. But above the sea of muddled plotting, there lies the ever-present narration from the Tony AI, a mediation on the random, joyful madness of human life that becomes clearly less the thoughts of an egotistical hologram and more Bendis’ final message to readers. Some of the closing narration from the Tony Stark AI in Invicible Iron Man #600. For the last few years, Tony’s life has been absolute hell—a jumbled mess of chaos that, in many ways, feels quintessentially Tony Stark. Now that Bendis has taken stock of that chaos, and embraced it, it’s up to a new team to pick and choose what to build on and what to let slip away when it comes to Iron Man’s future. And so ends the legacy of one of Marvel’s most prolific creative minds in recent memory, for better or worse.